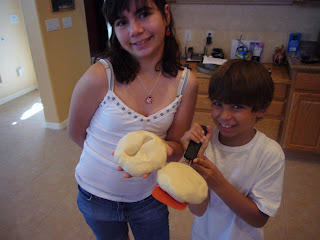 In an effort to combat the summer boredom that has started to set in, the kids asked if we could make play dough. Actually, I was in the midst of making pizza dough, and they like to pretend they are in a pizza tossing competition, like they saw on the Food Network. 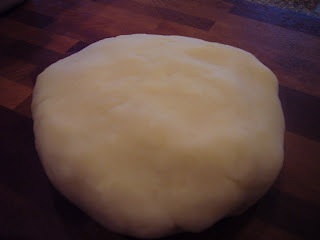 So to avoid having them ruin good pizza dough, I suggested we make homemade play dough. So who do you think ended up making it? Yes, me. And what started out as a fun way to pass the afternoon quickly escalated into a dough-throwing match that ended with me swearing never to make playdough again. I found this recipe a long time ago on the Family Fun website. It's quick to make, and unless your children are grinding it into the pavement like mine do, it lasts for a few weeks. Combine all ingredients in a large pan. Cook over medium heat, stirring constantly, until mixture thickens and pulls away from the sides of the pan. Remove from heat - it can be colored at this point. Cover tightly to store.